Maine’s scenic highways are consistently ranked among the nation’s top ten motorcycle routes. With 3,478 miles of breathtaking coastline, over 60 lighthouses and almost 50 peninsulas to explore, there’s plenty of natural beauty to appreciate as you travel the state’s picturesque byways. But before you set out on the motorcycle adventure of a lifetime, it’s important to refresh your knowledge of motorcycle safety. 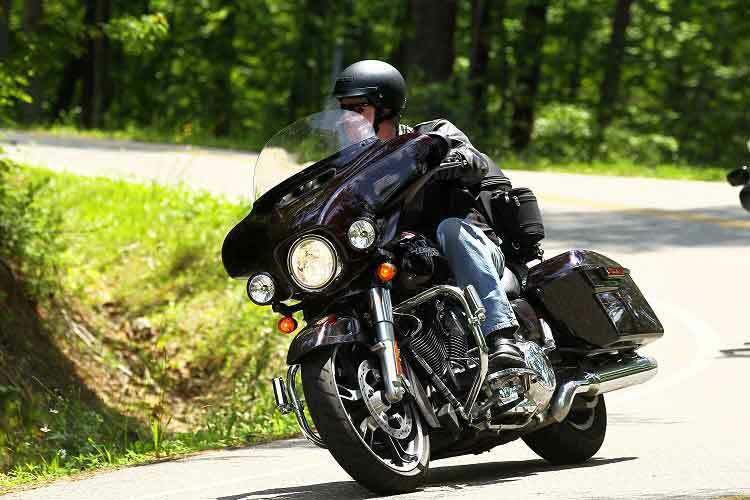 Head injury is the leading cause of death in motorcycle accidents. A rider not wearing a helmet is 40% more likely to die of a head injury than one who isn’t wearing a helmet during an accident. Function: When purchasing a helmet, go for function and safety over looks. Novelty helmets do not offer adequate safety protection. Select a helmet that meets recognized safety standards and regulations. Fit: Your helmet should fit snugly, and you shouldn’t be able to fit more than a fingertip between the helmet and your forehead. Consider a full face or flip-up helmet, which offers more protection and also helps protect the rider from road debris, bugs, and the elements. Full face helmets are designed to be more aerodynamic, which also helps minimize rider fatigue. Make sure your helmet has good ventilation and superior visibility. Do not buy used helmets, and replace helmets that have been dropped or involved in a crash. Experts suggest replacing all helmets every five years. Smooth Operator: Get a valid motorcycle driver’s license. If you are a new rider, know your limits and understand how to keep yourself and your bike well balanced and maintained. Give yourself time to get the hang of riding. Don’t push yourself or your bike past the limits of safety or common sense. Arrive Alive: Never operate your motorcycle under the influence of drugs or alcohol. 42% of motorcycle riders who died in a single vehicle crash had blood alcohol levels above 0.08%. If you are tired, stop and take a rest. Avoid all driving distractions. Save talking, texting and fiddling with the radio and other electronics for rest stops. Need For Speed: Excessive speed is a factor in 48% of motorcycle fatalities. You don’t have to go fast to have fun. Slow down and enjoy the ride. Not only will take in more of Maine’s picturesque beauty, but you’ll also significantly reduce your chances of being injured in an accident. Look Out Lefties: 38% of fatal traffic accidents (involving two vehicles) occur when a vehicle is turning left in front of a motorcycle (failure to yield). Approach situations where another vehicle should yield with extreme caution, because they may not see you. Mind the Messes: Sand, gravel, wet pavement, icy conditions, and fog are all dangerous for motorcycles, which have less traction than automobiles. Avoid driving on the road shoulder, and be extra cautious in construction zones. If an accident occurs as a result of unsafe road conditions (such as gravel in a construction site or another vehicle leaking oil) it is possible that another party is liable for damages incurred in your accident. Look Ahead: A good rule of thumb is to assume other motorists can’t see you. That way, you’ll learn to anticipate when other drivers make sudden lane shifts, to avoid their blind spots, and focus on keeping a safe distance between yourself and other vehicles. Never split lanes, speed or drive on the shoulder of the road. In heavy traffic, keep an eye on the motorist in front of you. Watch their head movements, not simply their tail lights. If they look down, slow down yourself (they may be distracted by a cell phone, other passengers, etc, which you can then anticipate by slowing down yourself). Many motorcyclists are injured when distracted drivers don’t notice them. It’s in your best interest to drive defensively whenever possible. Safe Gear: Increase your visibility by keeping your headlights on, and wearing bright, reflective clothing. Keep yourself safe by wearing high-quality safety gear when you are riding. Although you may feel footloose and fancy-free hopping on your bike in a t-shirt, shorts and pair of sandals, you need appropriate safety gear- unless, of course, you want to be a SQUID (aka Stupid Quick Underdressed Imminently Dead)! Exploring Maine’s spectacular scenery will be even more enjoyable when you stay safe, alert and don’t become another motorcycle accident statistic. If you are injured in a motorcycle accident and suspect the other driver was at fault, or if you were injured in a hit and run accident, contact the experienced motorcycle accident attorneys at Hardy, Wolf and Downing. We understand motorcycle personal injury cases and can help assess your case and secure the fair and just compensation you deserve.